The EP2000 and EP4000 represent everything musicians love about our popular EP1500/EP2500 - excellent sound quality, road-worthy toughness and reliability, low-noise operation and incredible power. With 2,000 and 4,000-Watts respectively, the EP2000 and EP4000 amplifiers are perfect for medium-sized club gigs, mobile PA systems, church services or public spaces. The über-simple front panel controls of these amps give you all of your sound's vital signs at a glance. After flipping the MAIN switch, the POWER LED will light when the amp is ready for action. Both channels have independent gain dials as well as clip LEDs that indicate when the signal is distorted and you need to reduce the gain. There are also SIGNAL LEDs that light up when a signal is present at the input. A panel of switches found on the back panel offers an array of cool options to apply to both channels of the EP2000 and EP4000. The Clip Limiter lets you get even more out of the amplifier without overdriving either it or your speaker system. Built-in circuitry automatically senses when the EP2000 or EP4000 is being overdriven into "clipping" and then momentarily reduces the input level to avoid clipping distortion. This all happens in a few thousandths of a second, so it's an inaudible way of avoiding audible clipping distortion. Of course, you can turn the Limiter off if you're feeling lucky. There's plenty of awesome features on the outside of the EP2000 and EP4000, but there's also a team of cool components on the inside helping it work its magic. They come loaded with famously reliable Toshiba/Fairchild power transistors as well as a high-current toroidal transformer for ultra-high transient response and further reliability. Independent DC and thermal overload protection on each channel automatically protects the amplifier and speakers from any show-stopping meltdowns. There's no need for fuses, giving you one fewer potential mid-gig headache. The EP2000 and EP4000 have both XLR and 1/4" TRS inputs. Even the outputs are totally flexible, consisting of Speakon-compatible outputs and five-way binding posts. Whether you're dealing with bare wire or boutique audiophile cabling, the EP2000 and EP4000 are right at home. It takes huge pulses of energy (current and voltage) to propel a woofer cone out fast enough to match a bass beat. That's called Transient Response and it's the holy grail of amp designers. By carefully selecting transistors with extremely highslew rates and optimizing other proprietary parts of our circuitry, our amps are able to react instantly to even the most demanding electronic bass impulses. If the woofers in your PA system can keep up, your audience will hear a tighter, crisper, more natural sound. If you read the reviews of the EP2000 and EP4000's older brothers, the EP1500 and EP2500, and it's clear that those amps are renowned not only for their performance and durability, but also their astoundingly low price tags. The EP2000 and EP4000 extend that legacy to the next level. 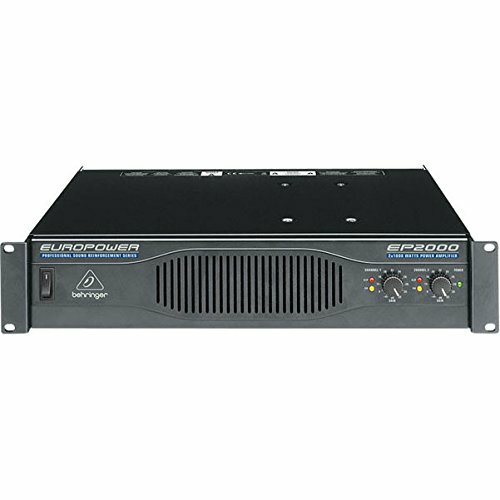 Why shell out for a "Brand-X" amp when you can get a BEHRINGER EUROPOWER amp and have money left over for other gear?